With the Match Color command, you can match the color saturation and brightness of one layer or document to those of another layer or document, and also remove a color cast. For the best results, use this command to unify photos that were shot with only slightly different camera settings or in similar lighting conditions, such as indoor fashion or product shots of the same or closely related subject matter. 1. Open an RGB document to be used as the source for color and tonal values, and a second RGB document to become the target of the color matching. 2. 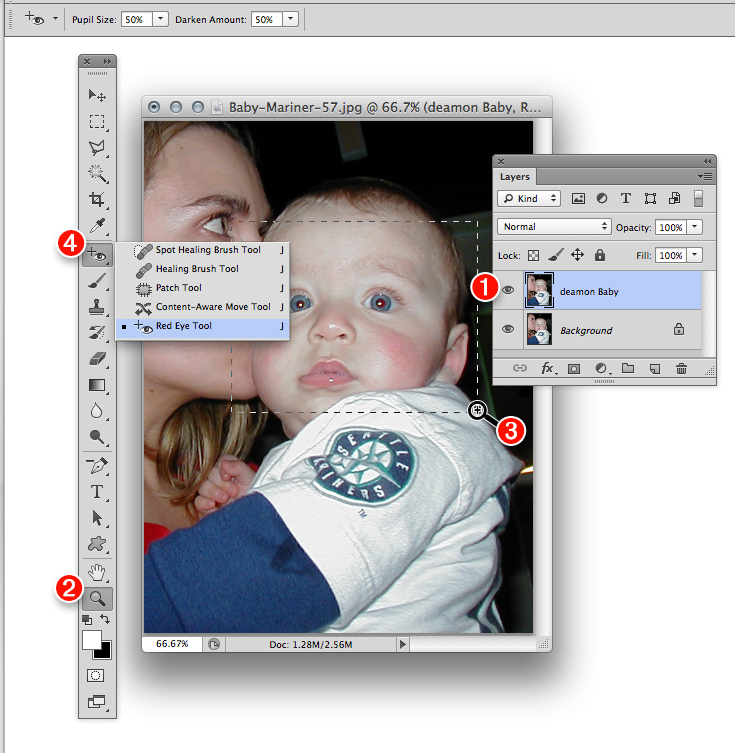 With the target document active, on the Layers panel, click the (3) Background, press Ctrl-J(PC)/Cmd-J(Mac) to duplicate it (in order to preserve the original pixels), and keep the duplicate layer selected. 3. 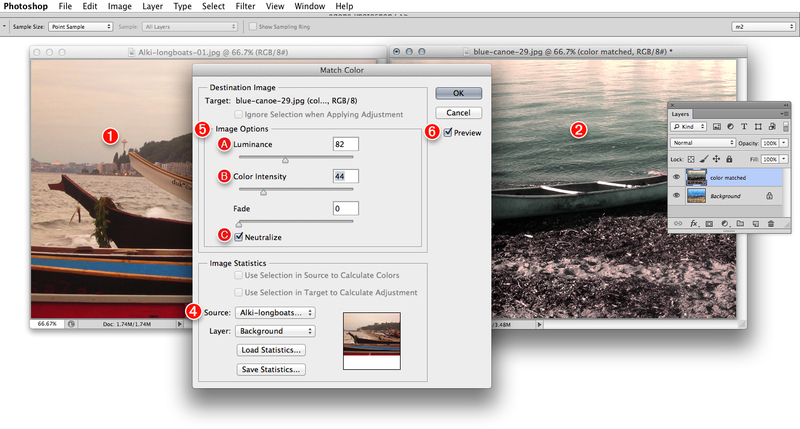 Choose Image > Adjustments > Match Color. 4. From the Match Color dialog box, in the lower Image Statistics section, choose the name of the Source: document that you opened in step 1. The target document will instantly adopt color values from the source document. Note: If the source document contains multiple layers, choose a source layer (or Merged) from the Layer menu. 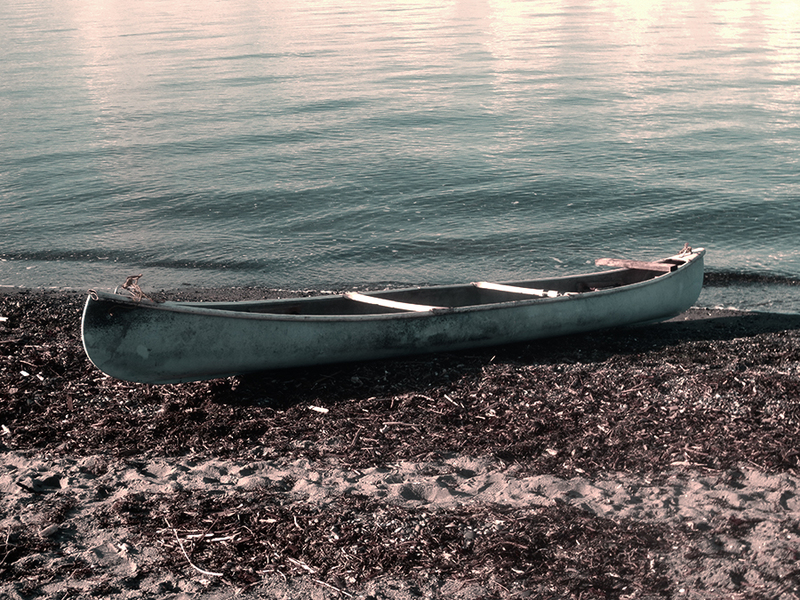 Move the (A) Luminance slider to adjust the overall brightness of the image (the default value is 100). 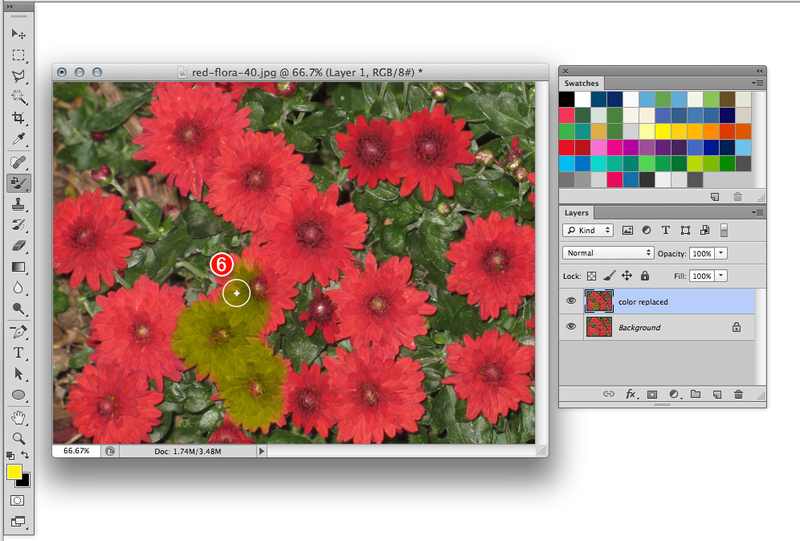 Move the (B) Color Intensity slider to adjust the color saturation (the default value is 100). 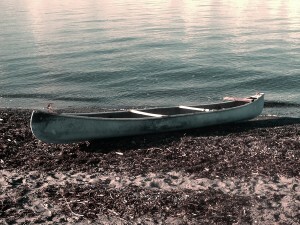 Move the (C) Fade slider to restore some of the original color to the image, if you want to blend the old with the new. Check Neutralize to remove any color casts from the target document. If this causes too great a color shift, lessen the effect via the Fade slider. 6. In the dialog, check Preview. Readjust any sliders, if needed, then click OK. Optional: To save your settings for use in other documents, click Save Statistics, choose a location for the data file, then click Save. The Color Replacement tool lets you change color values in areas of an image you apply changes manually with a brush. 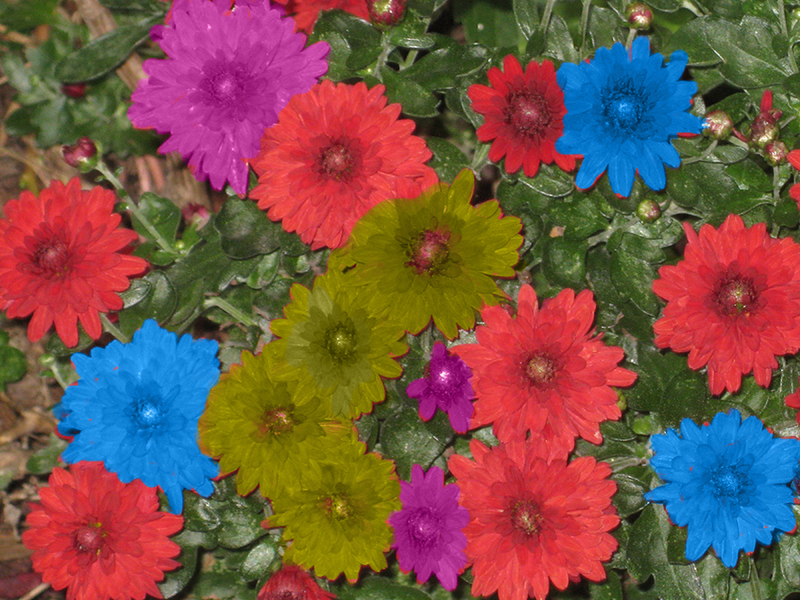 Unlike the Brush tool, the Color Replacement tool attempts to preserve the original texture (luminosity values) of an area as it replaces colors. This tool, like the Replace Color and Match Color commands, will be of particular interest to advertising and catalog designers. 1. 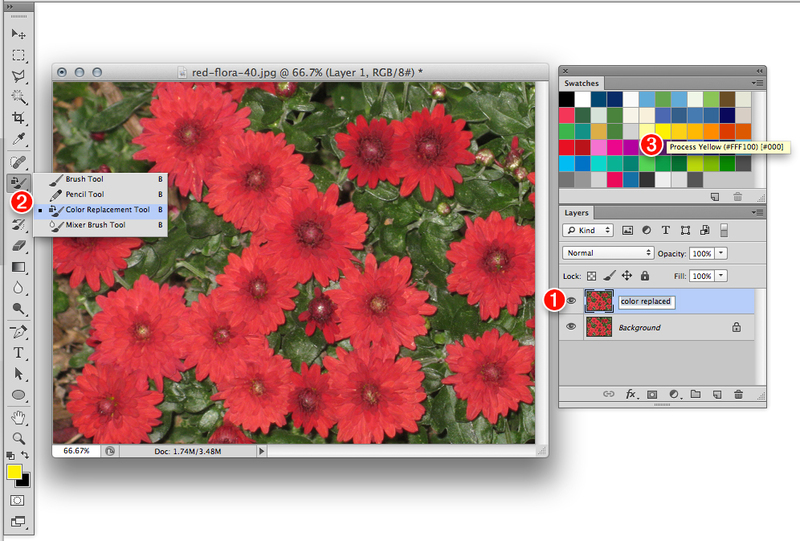 Duplicate the Background in an RGB image to preserve the original pixels, and keep the duplicate layer selected. 3. As the replacement color, choose a Foreground color via the Color or Swatches panel, or double-click on the Foreground swatch to open the Color Picker, or sample a color by Alt/Option clicking in the document. 4. If the color you chose isn’t on the Swatches panel, add it to the panel by clicking the New Swatch of Foreground Color button. 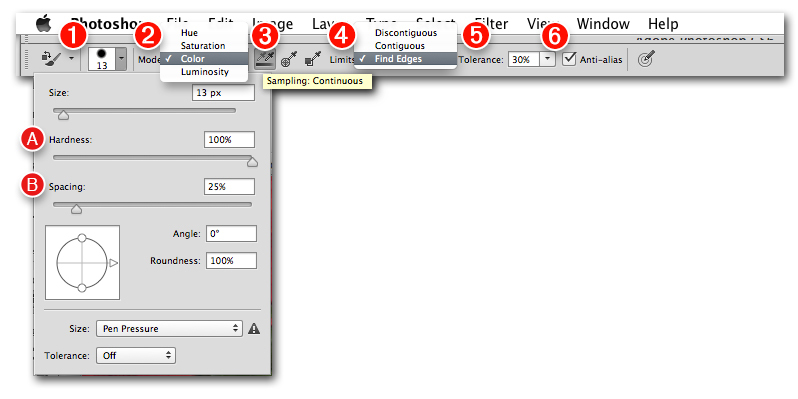 On the Brush Preset picker, choose a high (A) Hardness value and a low (B) Spacing value. • Continuous to apply the current Foreground color to all pixels the brush touches (we prefer this option because it lets us replace both light and dark colors). • Background Swatch to replace only colors that match or are similar to the current Background color (for this option, choose a Background color). From the Limits menu, choose Discontiguous to recolor only the color that is sampled under the pointer; or Contiguous to recolor the sampled color plus adjacent pixels within the current Tolerance value; or Find Edges (our favorite option) to recolor pixels under the pointer plus adjacent pixels, while keeping the color replacement within discrete image shapes. Choose a Tolerance value (1-100%) for the range of colors to be replaced. A high Tolerance value permits a wide range of colors to be recolored; a low value allows only pixels that closely match the sampled color to be recolored. Check Anti-alias for smoother transitions between the original and replacement colors. 6. Adjust the brush diameter by pressing the bracket keys: [ or ], then drag across the areas to be recolored. Only pixels that fall within the chosen Sampling, Limits, and Tolerance parameters will be recolored. When using the Color Replacement tool, you can change Options bar settings or the brush diameter between strokes. Red-eye (red in the pupil areas) in a portrait photo results when a person in a relatively dark room looks straight into the camera lens, and light emitted by an electronic flash reflects off his or her retinas. This is less likely to occur if you use a flash bracket and an off-camera flash-and if the subject looks away from the camera. To remove red-eye from a photo that was taken without such preventive measures, you can use the Red Eye tool in Photoshop. 1. 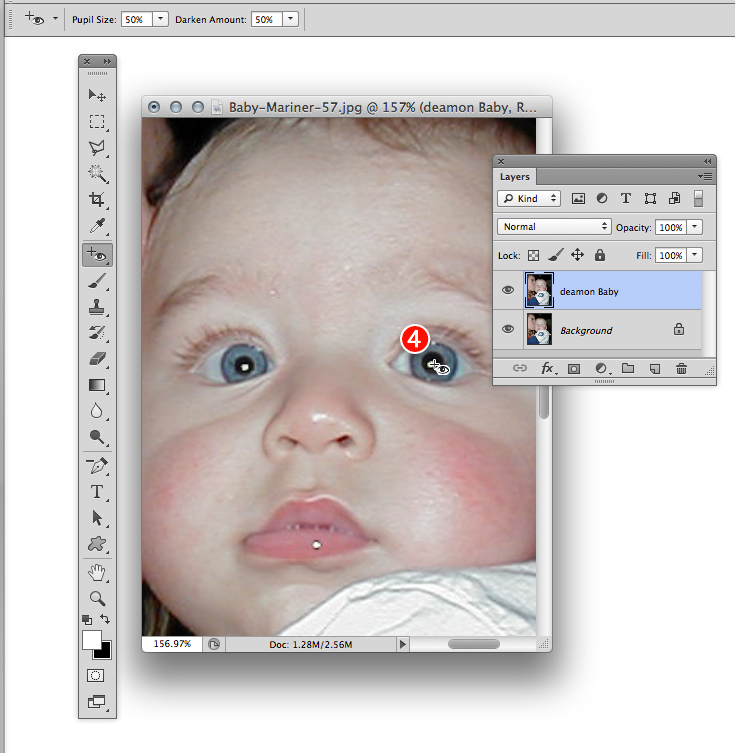 Open a portrait photo, duplicate the Background, and zoom in on the eye area. 2. 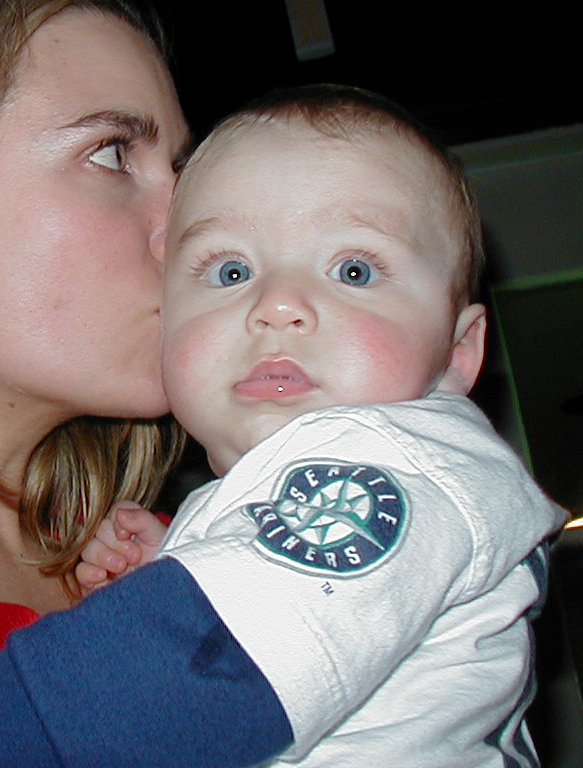 Choose the Red Eye tool (J or Shift-J). Choose a Pupil Size for the size of the correction. You can start with the default setting of 50%, and see if you like the results. You don’t want the tool to enlarge (dilate) the pupil. Choose a Darken Amount to control how much the tool darkens the pupil in order to remove the red. Try a setting below 30% for light-colored eyes, or above that value for dark-colored eyes. 4. Click once on the red area in each pupil. The tool should remove all traces of red, replacing it with black. If not, see the next task. Note: If the tool enlarged the pupil too much, undo the results, lower the pupil Size value, then click again. Similarly, if the red removal was incomplete or the pupil became too dark, undo the results, then try again with a different Darken Amount value. You don’t need to drag across the eye with the Red Eye tool; the tool is clever enough to find the pupil area automatically with a simple click. If you notice traces of red in the irises of the eyes (the area around the pupils), you can eliminate them. 1. Zoom in on one eye. 2. 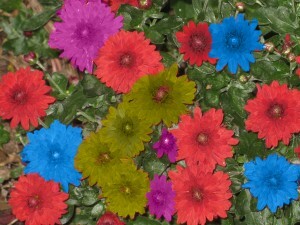 Choose the Color Replacement tool (B or shift-B). 3. On the Options bar, choose Mode: Color, Sampling: Once, Limits: Contiguous, and Tolerance: 30%. 4. Make the brush tip very small, Alt-click/Option-click a color in the iris of the eye, then apply short strokes over the remaining traces of red to recolor them with the sampled color. 5. Repeat with the other eye.